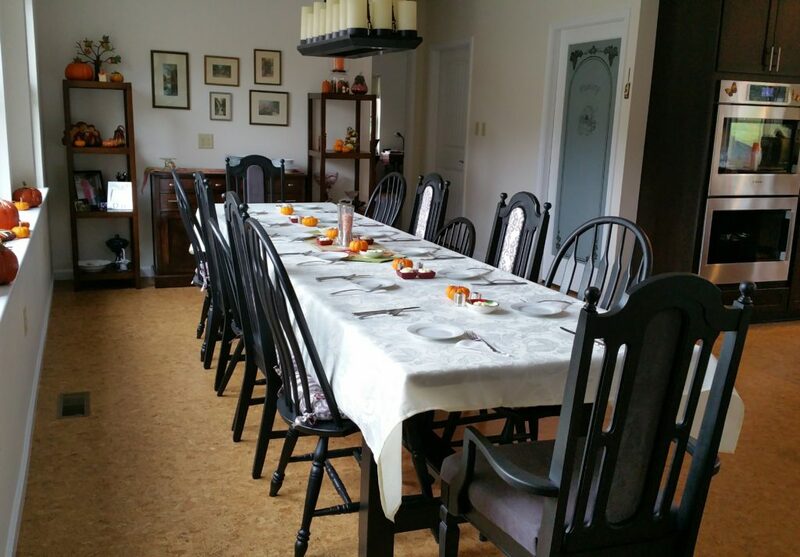 The dining room table all set for Thanksgiving dinner… seating twelve. 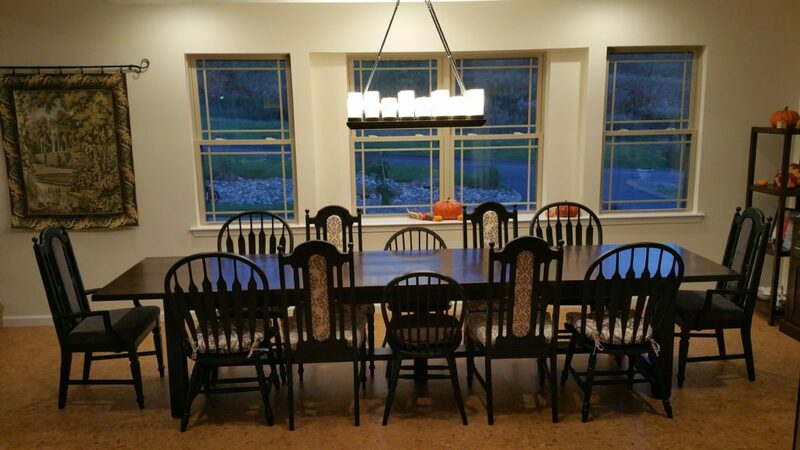 Back in August, I finished building our new dining room table. It fit quite nicely in the new dining room, but seemed to lack a certain something… like chairs. We had four chairs from our old dining room table, but that seemed wholly inadequate for a twelve foot long table. 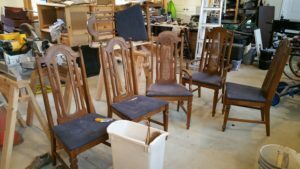 Most of the dining table chairs that we found in stores and on websites were at least $100 each, which isn’t all that bad if you only need a couple, but needing twelve chairs… not gonna happen. 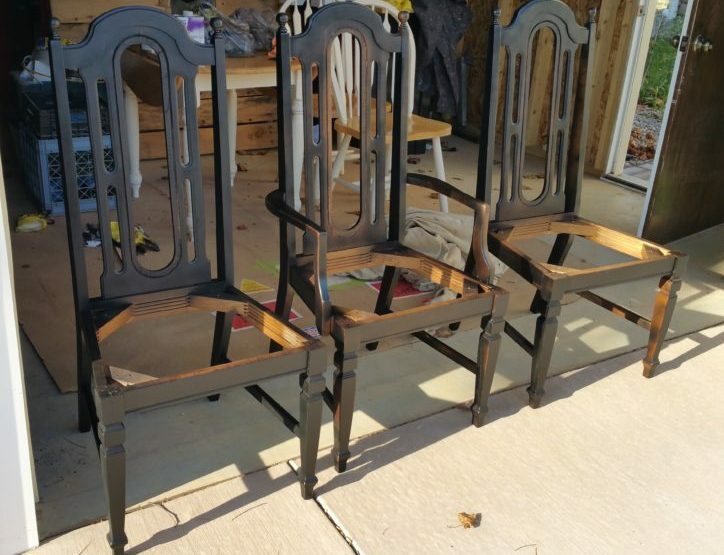 A few months before, I’d seen a picture on Houzz.com (which I can’t seem to find again) that had a long table with chairs of various styles but the same color scheme. Lori and I both thought that would work, so that began our search. 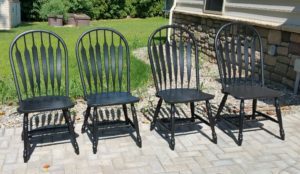 She first found these six chairs at the Salvation Army store for $5.00. Not $5.00 each. $5.00 for all six. They were ugly, but were in not-too-terrible shape structurally. I set about fixing any wobbles and Lori ripped out the rest of the broken cane in the backs and un-upholstered the horribly-stained blue cushions. 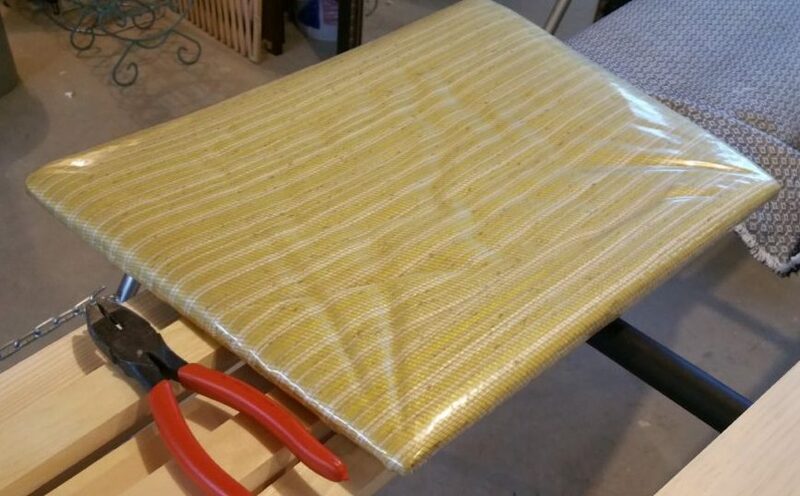 Underneath the blue fabric, she found… plastic-wrapped, mustard-yellow-striped fabric. Classic. No… what’s the opposite of classic? 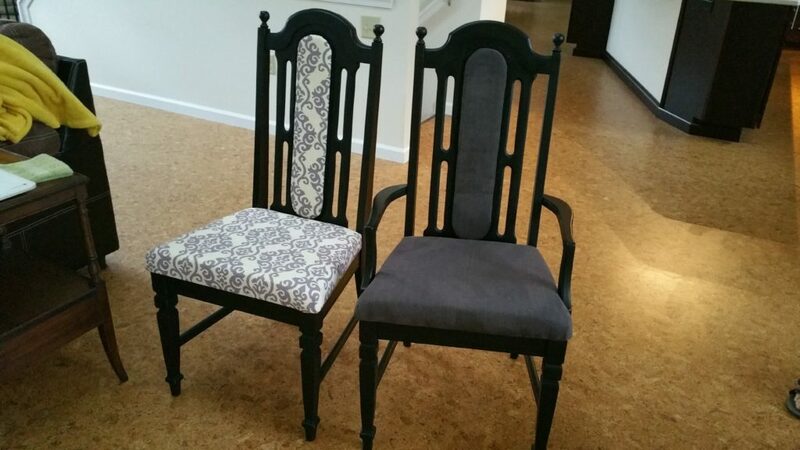 We decided to go with a black and purple’ish theme for the chairs. The kitchen has some purple in it along with the coffee-colored cabinets and the base of the table is black, so those colors would tie everything in and should work fine. 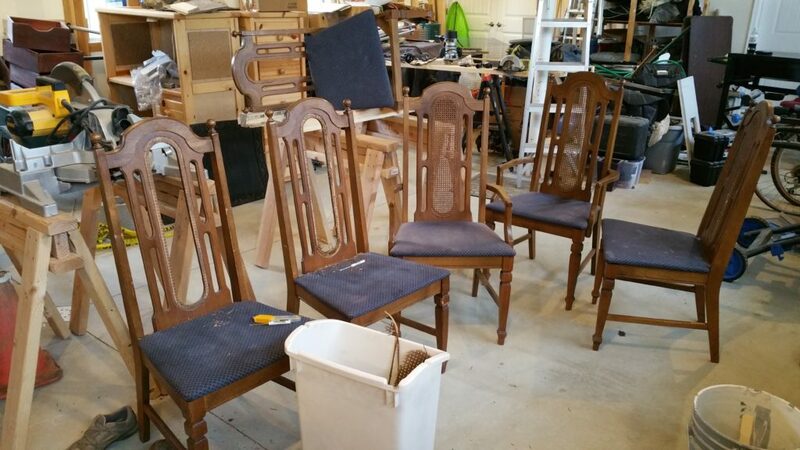 We got some additional chairs from a friend who was getting rid of them (free!) 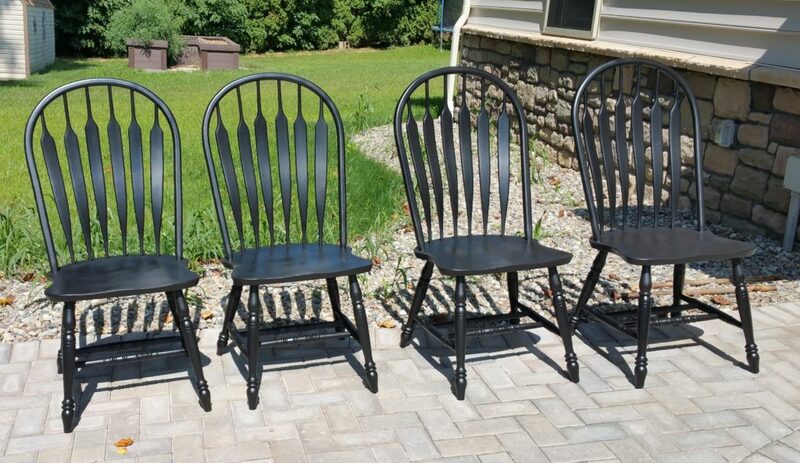 and Lori set about getting them all painted black. So when all the painting, upholstering, and cushion-tying was done, this is what we ended up with… an eclectic style with the capacity to seat twelve people at the table with plenty of elbow room.